If your tiny bathroom is giving you more of an AAAARGH! feeling, this post is definitely for you. As a bathroom designer, I strive to give my clients the feeling that they have large spacious bathrooms even if they actually don’t. A skilled designer looks at a small bathroom and sees infinite possibilities for making it look larger. If you’re thinking of giving your bathroom a makeover, knowing where to start can be overwhelming. I’ve listed 22 ways to make your small bathroom look better below. Of course, everyone’s bathroom (and tastes) are different. That’s why I suggest you pick 2 suggestions from each category (Floor, Walls, Ceiling, Details). Just implementing 4 – 8 of these 22 tips can make a huge difference in your small bathroom. Second, understand how you’ll be using your bathroom. The way you decorate your guest bathroom might be different than the way you decorate your master bathroom. Getting clear on these lifestyle decisions before you move forward can really help. Who is using this bathroom? Is it primarily for you and your partner? For guests? This will impact how decorative or simple it is, as well as how much storage you’ll need. Tip #1:Don’t compartmentalize. In general, open spaces look considerably larger than ‘broken’ ones. Try to avoid distinguishing different sections of your bathroom with different tiling or other partitions. Also, I highly recommend that you add interest and texture by using the same color or color family, but different shapes and sizes. Tip #2: Mind your tile lines. The eye naturally follows lines. This is why vertical stripes make us look thinner. Use this to your advantage by arranging tiles in rows perpendicular to the longest lines in your bathroom. In other words, arrange your tiles so that the lines run across the narrowest dimension of the room, to offset this shorter distance. This will increase the visual width where you need it. Tip #3: Mind your grout. I recommend using grout that is the same color as your tiles, whether they are large or small. The exception would be to use a light gray or white grout with multicolored glass or stone mosaics. The neutral grout compliments and punctuates multiple colors nicely. Also, using large tiles in a small space can actually make it appear larger. That’s because there are fewer grout joints, which reduces the lines that appear across the floor. Tip #4: Keep tiling consistent throughout the space. Tile the shower floor and the threshold (curb) in the same color as the bathroom floor. Or if you are using a pre-fabricated pan for your shower floor, choose a color close to the floor. I use Swanstone shower pans a lot because they are affordable and come in a variety of colors. Avoid using a different color tile for the shower floor — it will break up the space, making the room look smaller. Tip #5: Install towel racks or hooks. Using wall space to store towels will help you preserve scarce cabinet, shelf, and counter space. For very small bathrooms, hooks on the back of the door or a towel bar on your glass shower door are great space saving solutions. Tip #6: Use large mirrors. In small rooms, big mirrors are best. If you can, get a mirror that goes to the ceiling installed behind your sink. This helps the ceilings look higher while expanding the square footage. Installing sconces in the vanity mirror instead of in the wall on either side of the mirror will bounce light around the room, doubling the amount of available light. Tip #7: Install a medicine cabinet. Similarly to towel racks, medicine cabinets help you utilize wall space for little odds and ends that would otherwise make the bathroom look cluttered. If you can recess your medicine cabinet into the wall, even better. Tip #8: Build recessed cubbies or larger shelves. Small recessed cubbies can look particularly elegant when done right. Built-in cubbies and shelves adjacent to the sink are a great option when counter space isn’t available. Tip #9: Try a high-drama statement wall. To create visual intrigue, choose a wall in your bathroom to make a statement. You can use tile, an accent paint color, wallpaper, or even hang your favorite collection for a personal touch. 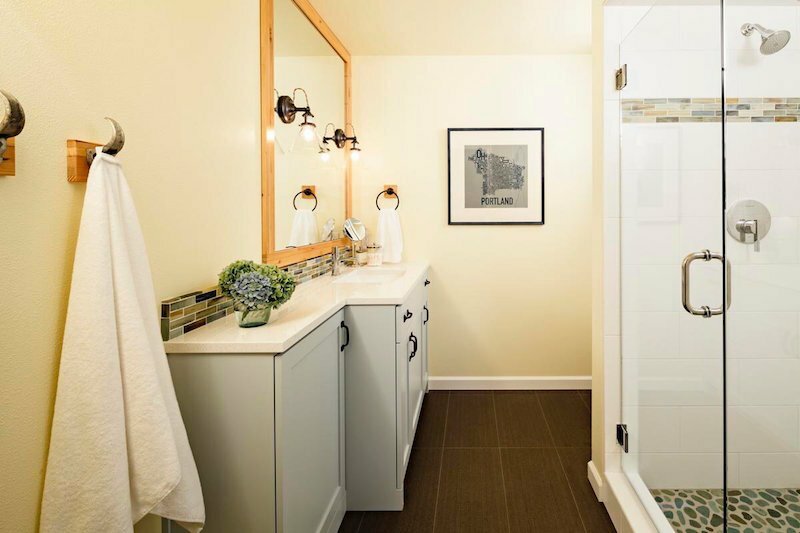 Just be sure the color scheme and style fits with the bathroom’s overall aesthetic. Tip #10: Incorporate vertical stripes into the tiling or wallpaper. This tip is especially important for bathrooms with low or sloping ceilings. Vertical striped walls helps ceilings look higher, making the room seem more expansive. Tip #11: Match your walls to your tiles. Rooms in a uniform color appear larger. As much as you are able, be consistent in the colors you chose to cover large portions of the bathroom. Tip #12: Splurge for glass tiles. 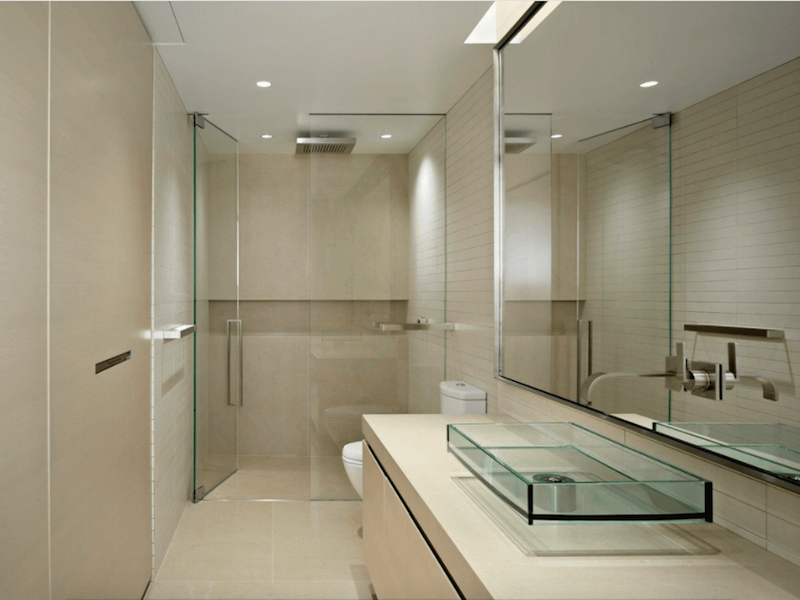 If your bathroom is dingy, glass elements like mirrors and tiles can help pick up light. If you have the opportunity to use glass tiles – either in decorative clusters or as part of a statement wall – do it. It will make the room sparkle. Tip #13: Get light into the bath. Installing a recessed can light above your shower/tub will help it feel less closed off from the rest of the bathroom and may help you wake up quicker if you shower in the morning. Tip #14: Install a skylight. 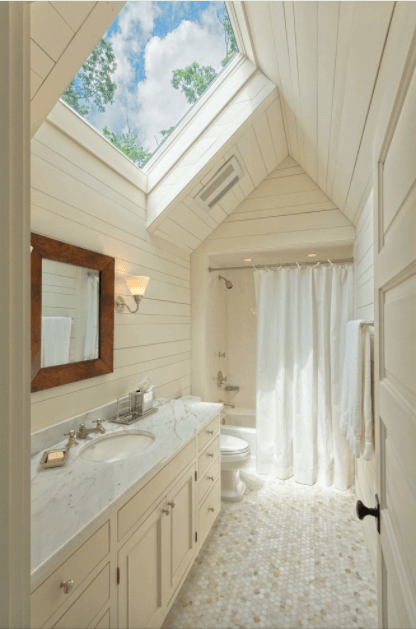 If your bathroom is on the top floor of your home, consider installing a skylight over the sink or bath. The extra light will help the room feel more open. If a skylight isn’t an option, install windows where you can to benefit from natural light. Windows with frosted glass give you the privacy you need while still letting in natural light. Tip #15: Paint your ceiling the color of your walls. Are you noticing a trend here? Painting the ceiling a different color, especially a dark color, will make it look low. Painting it white will stop your eye right at the ceiling line, also making the bathroom feel small. When the eye can travel effortlessly, your space will expand visually. Tip #16: Prioritize storage. Clutter will make your room smaller because it takes up space both physically and visually. For this reason, an organized bathroom looks best. If you want to make your bathroom look larger, implementing all of the points in this section will also be helpful. For more organizing tips for every room (including your bathroom) read How to Organize Your Home Room by Room. Tip #17: Use a combination of open shelves and closed doors. 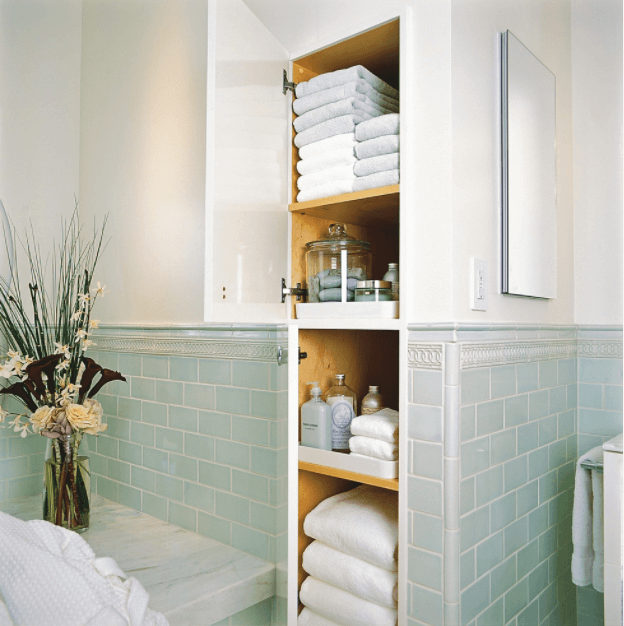 Closed cabinets are a necessity in the bathroom, especially bathrooms that guests frequently visit. No one wants to keep their toiletries out in the open. But too many closed cabinets can overwhelm a space, making it look smaller. To combat this, choose cabinets with a combination of open shelves and closed doors. Keep doored cabinets closer to the floor with open shelves higher up. Tip #18: Choose narrow shelving units. If you’ve ever wanted to try those cute ladder shelves, this is the place for it. Narrow shelves are a good way to build in extra storage space without taking up much room. Tip #19: Use glass for your shelves. There is definite visual intrigue with glass because it is see-through and reflective at the same time. Glass shelves make otherwise bulky units look airy, contributing to the openness of your bathroom. Tip #20: Install a corner unit. If your small bathroom happens to have an awkward shape, installing a corner unit like a toilet or sink with a corner cabinet above can help you get the most out of your available space. Tip #21: Don’t swing, slide. Doors that swing inward cut into floor space. Install a pocket door at the entrance to your bathroom and you will be amazed at how much visual space you will gain. Sliding doors are also great to install on hard to reach cabinets adjacent to toilets and tubs. Tip #22: Lose your shower curtain. Replace your shower curtain with a clear glass door. Taking the glass almost all the way to the ceiling also helps make the ceiling look higher. Are you ready to tackle your small bathroom project? Mosaik Design & Remodeling can help. Take a look at some of our past bathroom projects. Or get in touch today! Excellent post with lots of wonderful ideas. We are in the process of adding a second bathroom. We decided to build a skylight above the shower and create a pony wall (instead of a full wall) for the shower as well. The goal was to let in as much natural light as possible. Seems to be working.